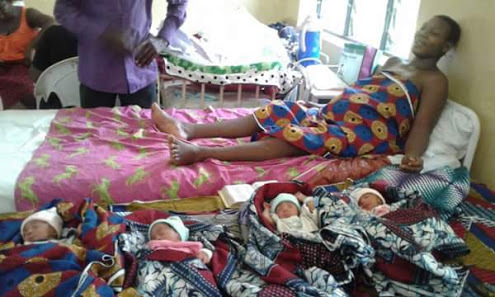 Mrs. Ruth Onyekachi Buzugbe of Okpe-Abavo in Ika South, Delta State was delivered of quadruplets at the Federal Medical Centre (FMC), Asaba. Mr Onyekachi while speaking with newsmen was filled with mixed feelings as he seems confused on how to handle the new responsibility considering his near zero financial status. Welled up in tears he thanked God for the rare gift calling on well- to - do individuals and government to come to his aid. "I am overwhelmed,please highly spirited people should come to my help, accommodating these kids in my one room apartment,feeding and medications are already telling on my family - my joblessness wouldn't help the situation, please I need assistance urgently," he pleaded.